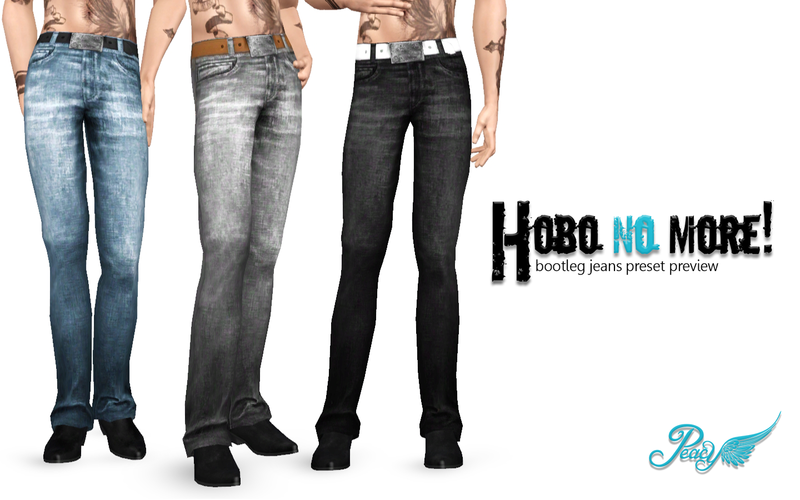 Today I bring you a retexture of my "For the Union" jeans i did a couple of weeks ago. 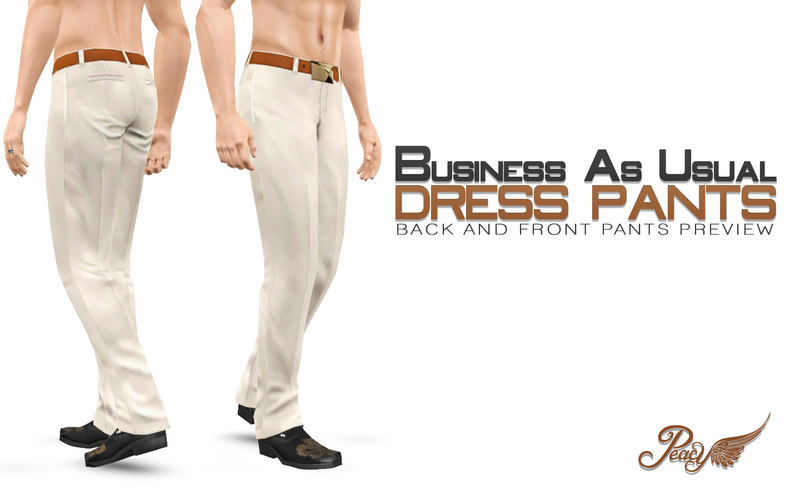 Tumblinrob said there were not that many dress pants options out there, so I took a look around and in-game, and he was right. 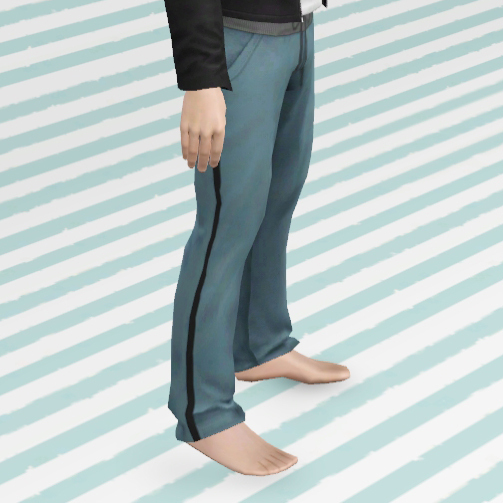 Not only that, but a lot of the options in-game are quite baggy. Not wanting to do a completely new mesh, I decided to redo the jeans, and after some issues choosing a buckle, I am really happy with how they came out. 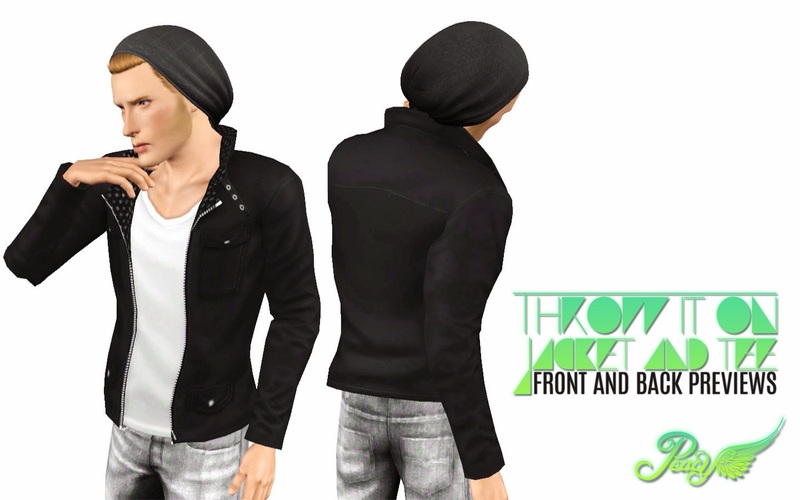 It is amazing what a retexture can do to give a mesh a completely different look. These are also slimmer fit and go well with a formal or casual top. Another week, another upload for all of you. 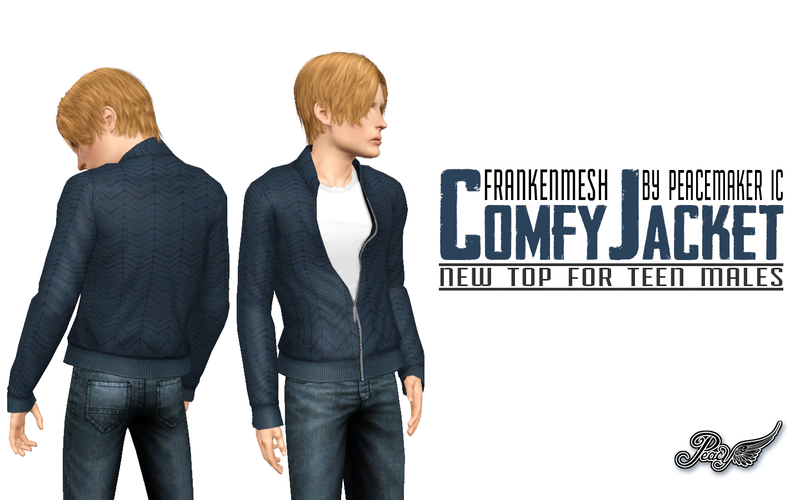 If you are wondering about the name, this bottom mesh actually came from the hobo outfit (can't remember which EP) which I separated, frankenmeshed and fixed up the texture on. 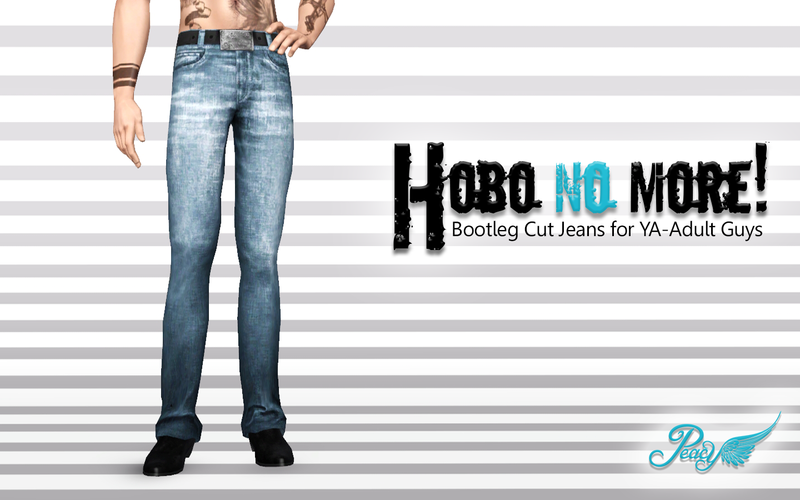 I sort of feel bad for taking the jeans from the hobo, but I like them too much to give them back now. 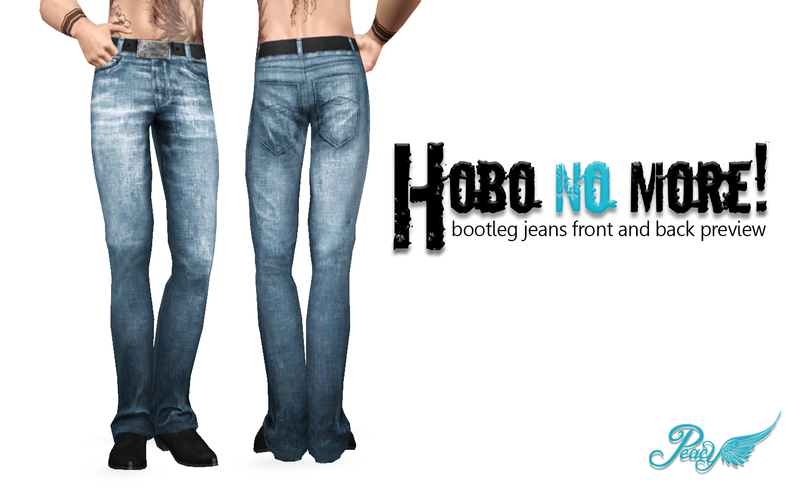 So if you need a pant-less hobo roaming around town in your games, this is the reason. And that buckle. If there was such a think as buckle love, this would be it. It just tops off these jeans in my opinion. Now Jebidiah is never taking them off. 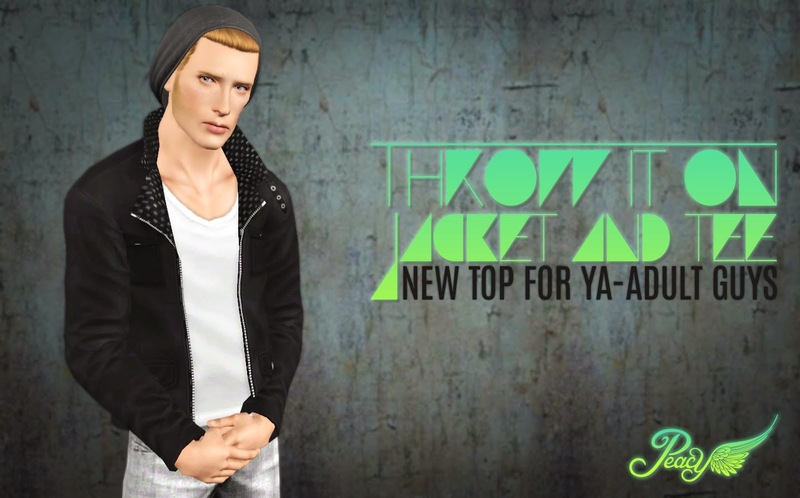 Part VIII of my 2000 tumblr followers gift, these are probably the coolest jeans I have created. So I thought to myself, why should teen guys miss out of these lovely jeans? Then I converted them and all was well again. 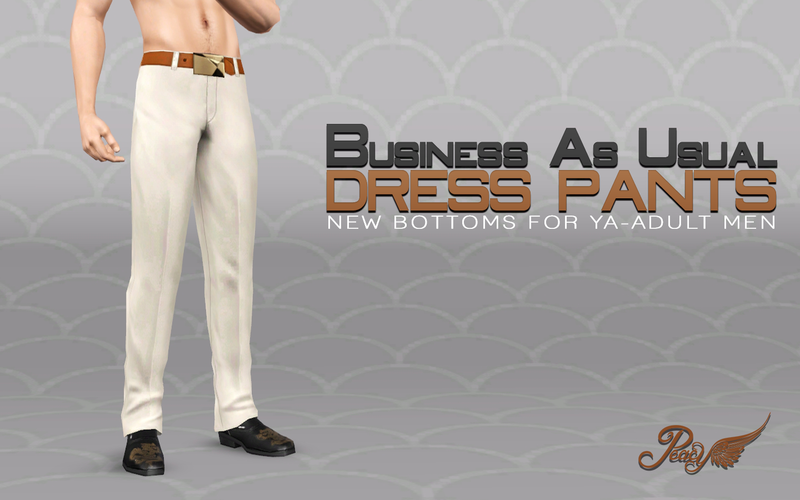 Part VII of my 2000 tumblr followers gift, this is something desperately needed by both adult and teen guys; pants. So I have converted my low rise jeans so the teens can enjoy them too. The style really suits the age group too. Part V of my 2000 tumblr followers gift, I give you the teen conversion of the comfy sweater. 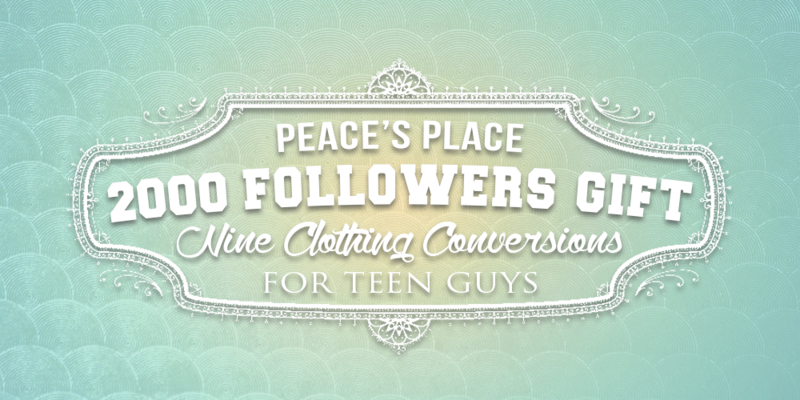 Just because teens are actively running around and causing mischief, doesn't mean they don't get cold too! 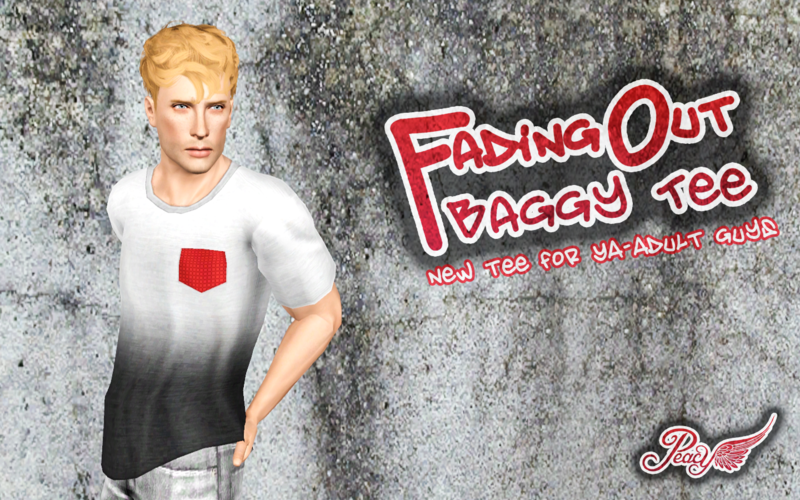 Part IV of my followers gift, here is my rolled sleeve tee converted for use by teen guys. 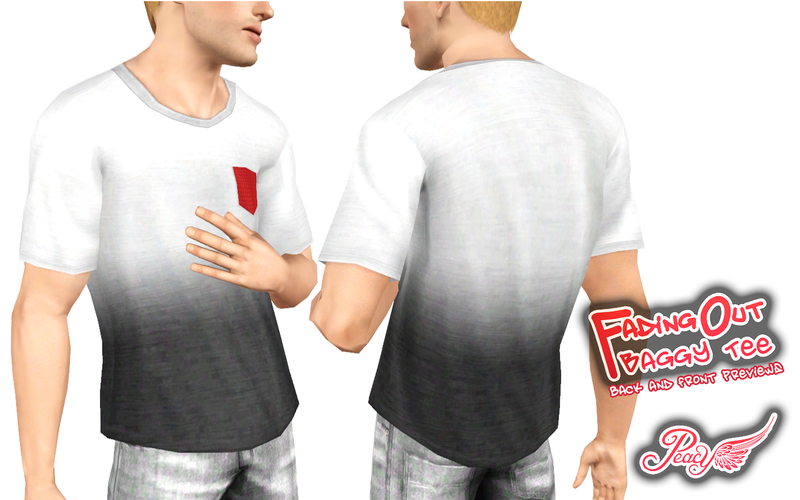 The guys don't actually have many tees to use, so now you have another casual top your boys can wear, either around the house or when they go out. 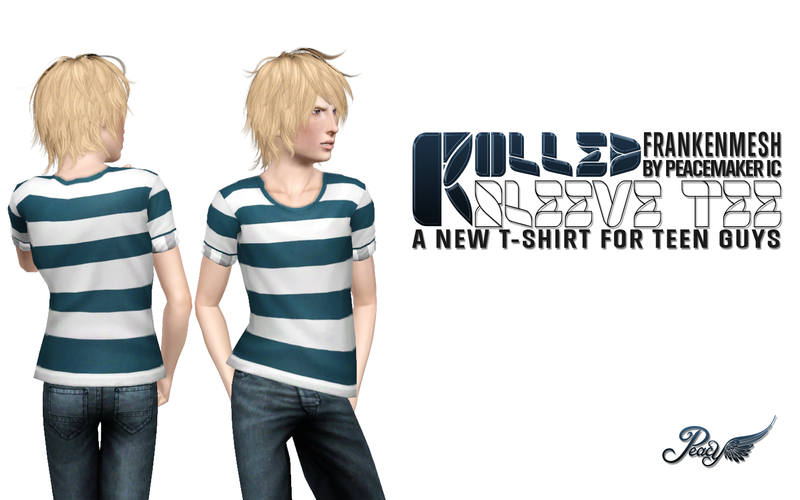 Part III of my 2000 tumblr followers gift, this is my original idea for a casual Henley shirt. This is personally my favourite Henley shirt style, and now you can have it for your teen boys. Part I of my 200 tumblr followers gift, I bring you a short sleeve version of my adult Henley shirt. This is a nice variant to have and gives you a bit more variation. YAY! Its Wednesday here and we know what that means; its time for a new upload! 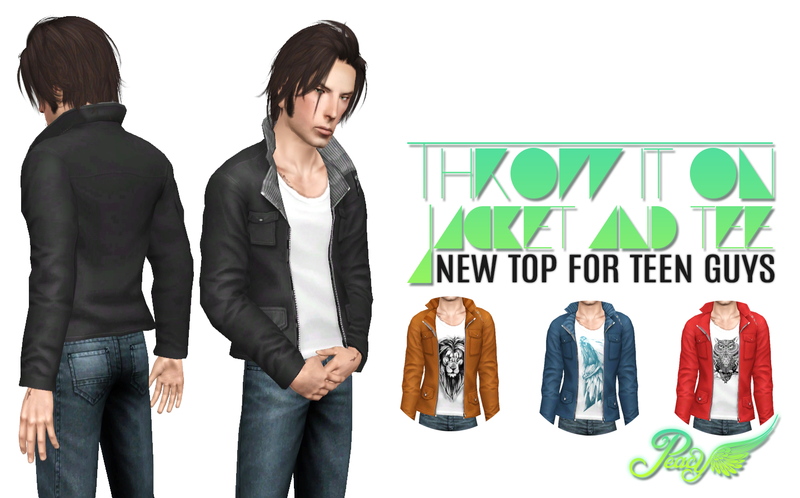 This week I give you a casual jacket with 3 stencils and 4 presets. I really liked the overall shape of the original jacket, but the overall feel was more on the preppy side then casual and youthful. So I changed that. 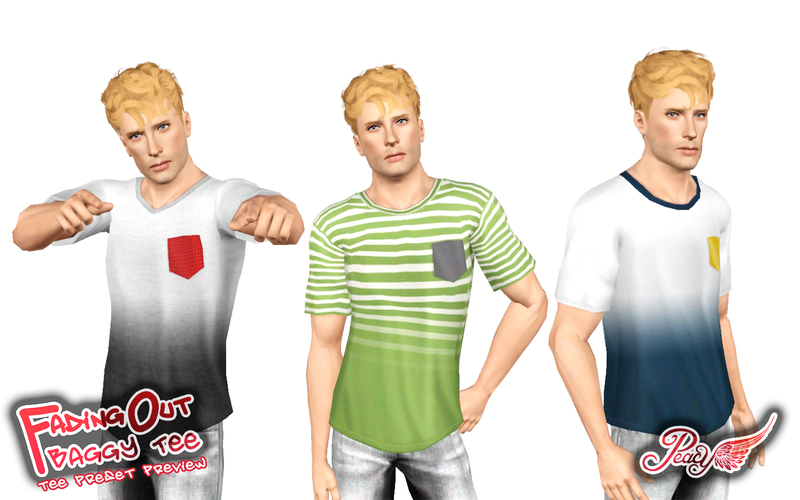 I striped out the shirt and vest, slimmed down and then added a t-shirt. This is the final product of that tedious process. 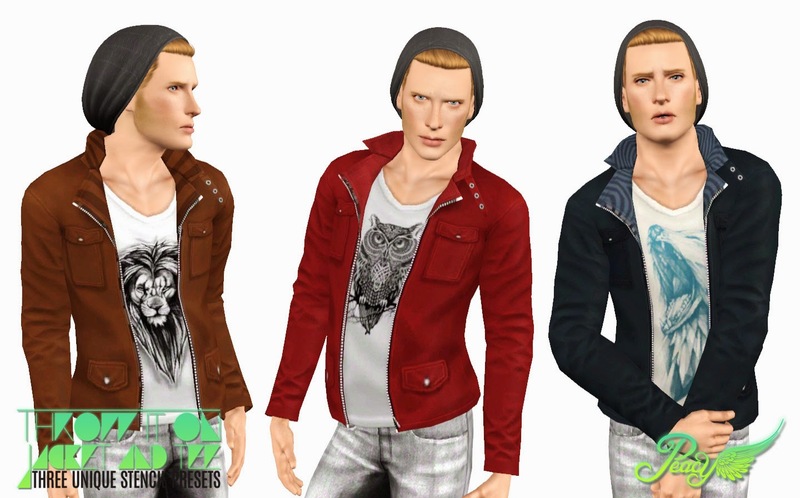 As usual, the archive contains both the sim3pack and package files accompanied by the preset preview picture. Choose which file type you prefer to install and delete and rest. I hope you enjoy. So please download the new updated file. You don't have to since its not a big issue, but its preferred since it is unknown how many pants this affects.